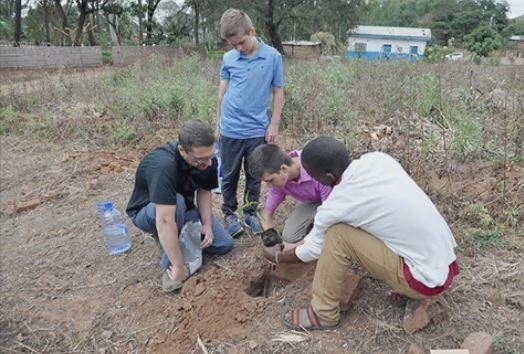 Sam and Nate Linsley buried their grandfather’s ashes in his home country of Malawi, as he had requested years before. Their grandfather, Gordon Kinlay Sellar, died 12 years ago, and had asked that his ashes be returned to his hometown in the African nation. For the two boys, it was a way of saying goodbye. “(We) brought his ashes, buried him there, and where one of the families we were staying with – Sarah’s house – it was near one of the streams where he played when he was a child, and that’s where we buried his ashes with some trees,” said Nate. The family travelled to Malawi with the Hope for Malawi Foundation, an organization that works to provide fresh water, foot bridges and early learning centres in the Domasi region. Working with the organization, the Linsley’s planted seven fruit trees on their grandfather’s grave to serve as a food source for the locals. Experiencing a new culture was a life-changing experience for Sam and Nate. “In Canada we have so much and we need so much to be happy, but in Malawi they need almost nothing, and they’re happier than I could ever be,” said Nate. The Linsley boys shared stories from their trip at an annual benefit brunch for the Hope for Malawi Foundation in Saskatoon on Sunday.